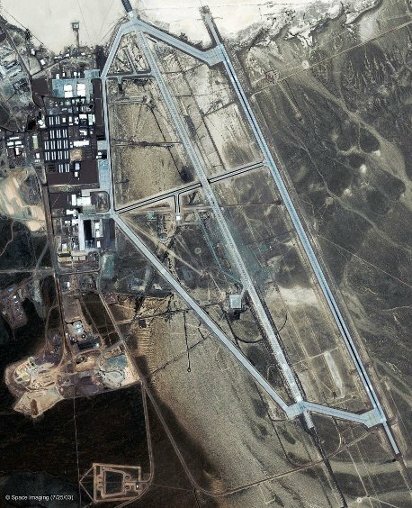 The secretive nature of Area 51 along with its connection to classified aircraft research and reports of UFO sightings near the base means that the base has become a focus for UFO enthusiasts around the world. • The storage, examination, and reverse engineering of crashed alien spacecraft (including material supposedly recovered at Roswell ), the study of their occupants, and the manufacture of aircraft based on alien technology. • Meetings or joint undertakings with extraterrestrials. • The development of exotic energy weapons. • The development of time travel and teleportation technology. • The development of unusual and exotic propulsion systems related to the Aurora Program. • Activities related to the Majestic 12 organization. Hypotheses concerning facilities at Groom Dry Lake Bed include claims of engineering based on alien technology along with test flights of this technology. Publicly available satellite imagery, (Google Earth for example) reveals clearly visible landing strips and buildings. Several people have claimed knowledge of past events at the base. These have included Bob Lazar who claimed in 1989 that he had worked at Area 51's S-4 facility, where he was contracted to work with alien spacecraft that the U.S. government had in its possession. The 1996 documentary Dreamland directed by Bruce Burgess included an interview with a 71 year old mechanical engineer who claimed to be a former employee at the base during the 1950s. His claims included that he had worked on a "flying disc simulator" which had been based on a disc originating from a crashed extraterrestrial craft and was used to train US Pilots. He also claimed to have worked with an extraterrestrial being named "J-Rod" and described as a "telepathic translator". In 2004, Dan Burisch claimed to have worked on cloning alien viruses at the base, also alongside the alien named "J-Rod". Burisch's scholarly credentials are the subject of much debate, as he was apparently working as a Las Vegas parole officer in 1989 while also earning a PhD. More on "What Is Area 51"